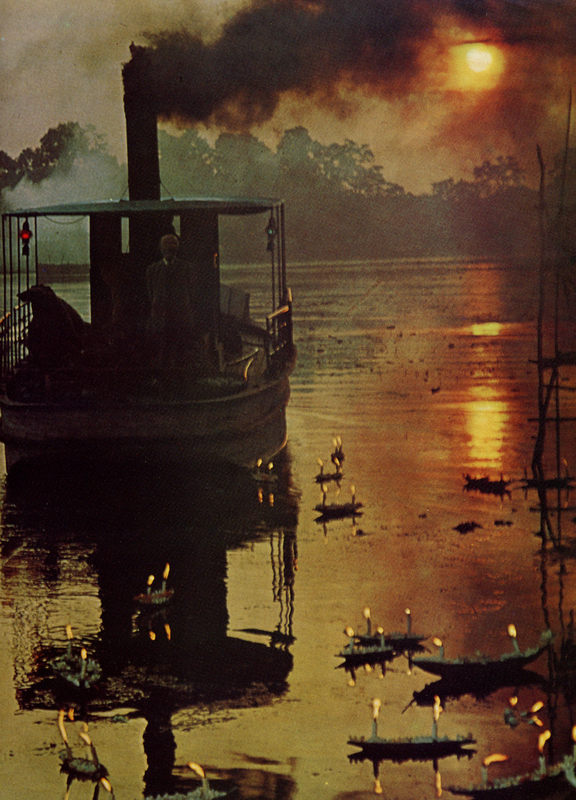 Joseph Conrad wrote : “If you want to know the age of the earth, look upon the sea in a storm. But what storm can fully reveal the heart of a man ? Between Suez and the China Sea are many nameless men who prefer to live and die unknown. This is the story of one such man. 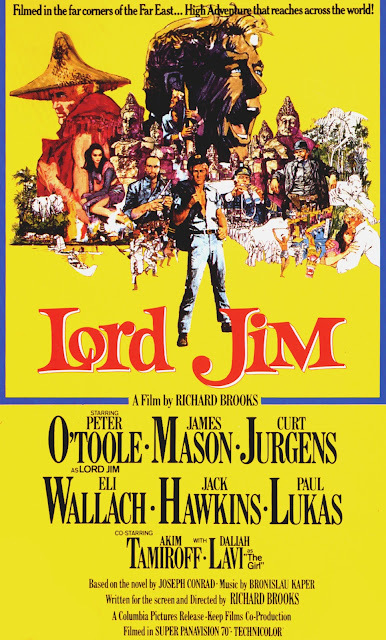 Among the great gallery of rogues and heroes thrown up on the beaches and ports, no man was more respected or more damned than … Lord Jim”. That’s the impressive beginning of Richard Brooks’ movie. 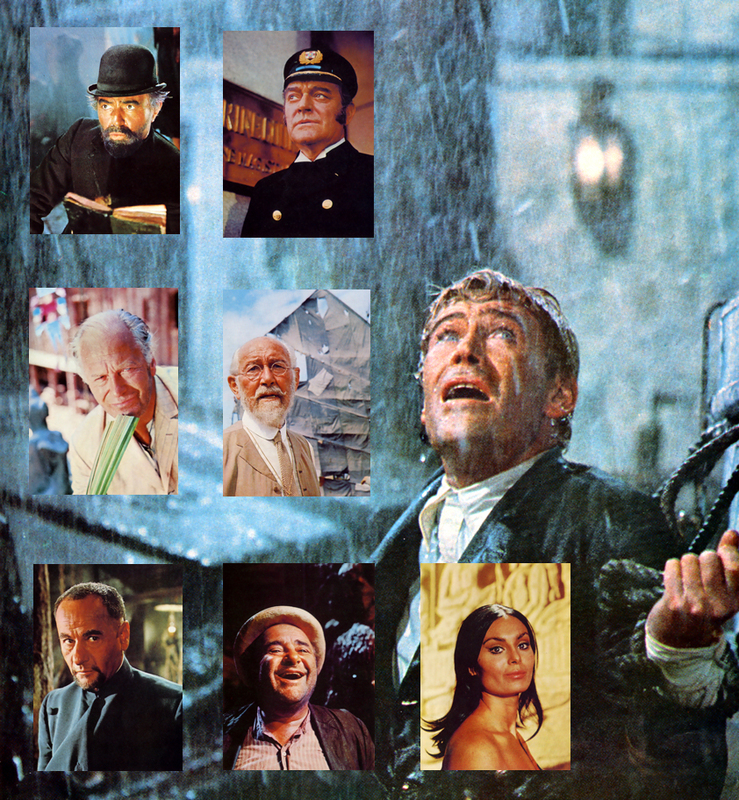 “Lord Jim” is the 16th film of the prolific American director Richard Brooks. 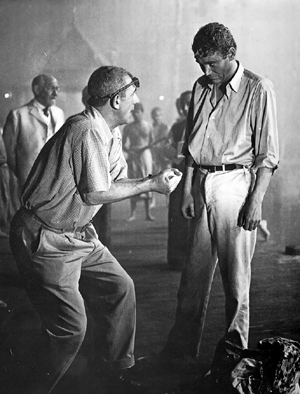 He wrote himself the screenplay based on the famous Joseph Conrad’s Novel and produced it with Associate producers Jules Buck and Peter O'Toole. 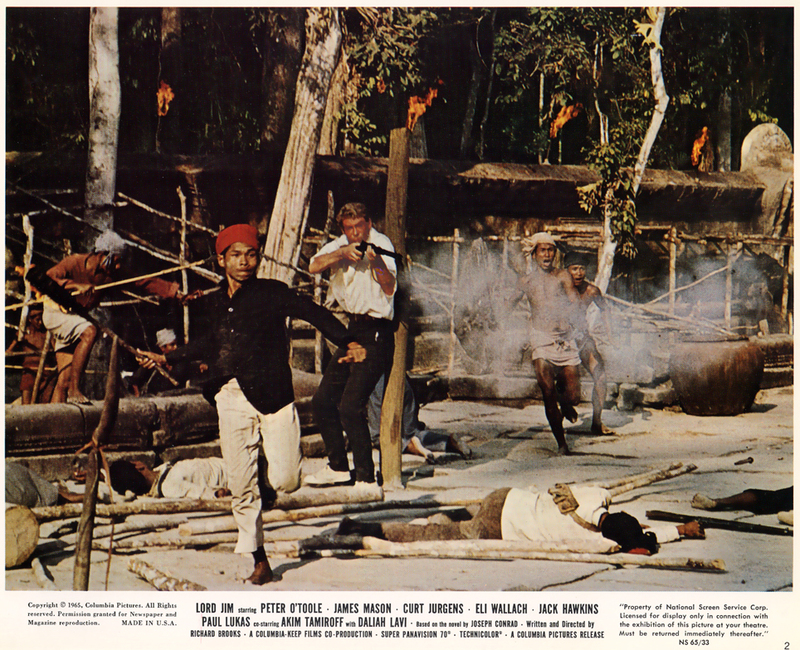 Despite Columbia had some doubts about the commercial project, they finally agreed in 1964 to make the production because they admired and trusted Brooks’ abilities in handling this adventure movie. During seven years, the perfectionist director spent a long time in developing the structure of the movie and writing the screenplay with a lot of researches on Indonesian culture and the local sets. 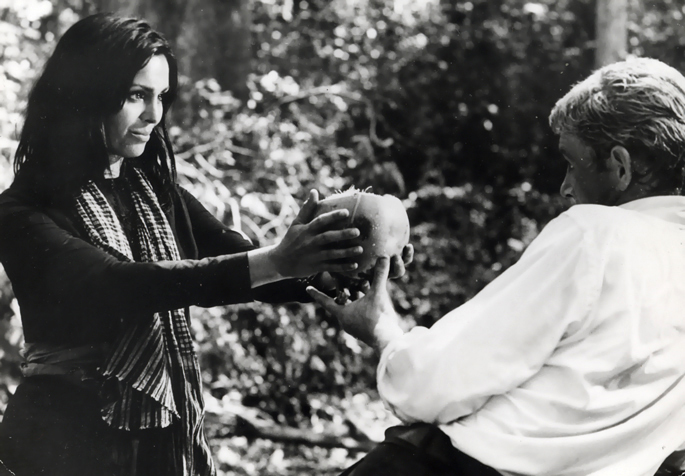 “Film are made in a different style than a novel… Films must be suited to audiences of diverse cultures, different languages, different levels of understanding, and different levels of education. A book communicates with words, requiring first an intellectual response from the reader and then an emotional response. A movie is the opposite. 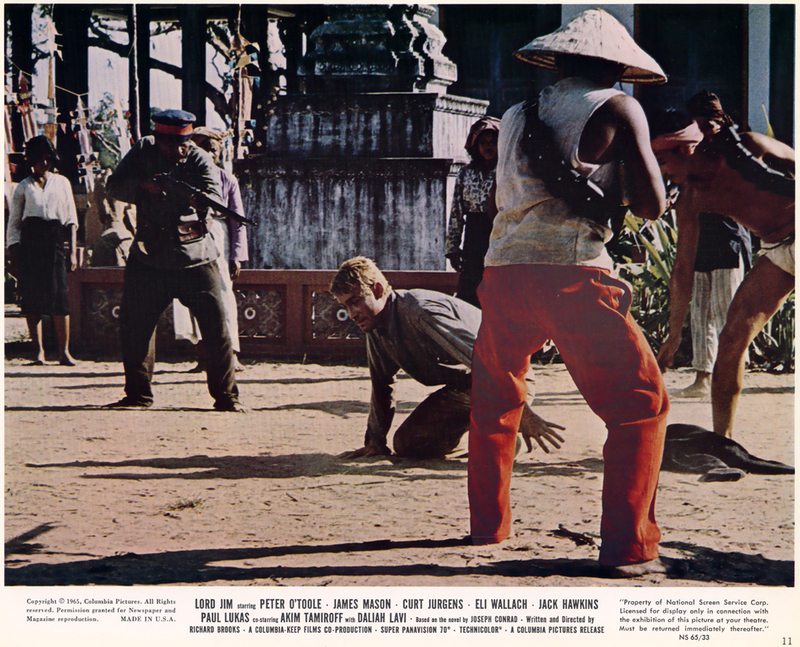 Words, dialogue, verbal expressions are secondary… What we remember of a movie is what we saw ! Images ! A movie deals mainly with images ! The reaction to a movie, like that of music, is primarily emotional. If all the images are put together skillfully, then the secondary reaction may be intellectual… A translation from words to images is necessary and that translation prevents a film from being exactly like a book. 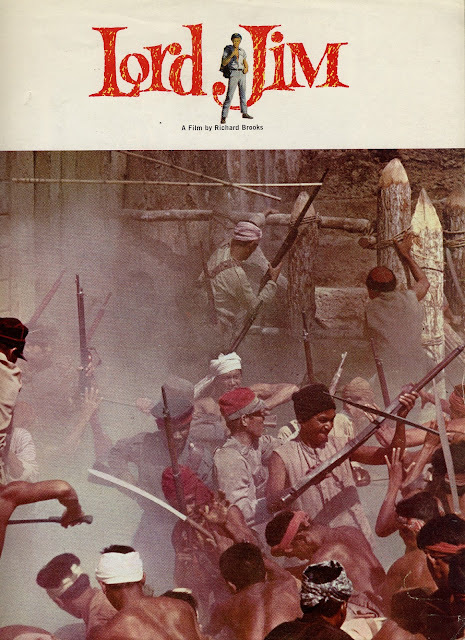 In the end, it is possible for them to be closely related if only the intention is carried out… Perhaps with luck, perception, skill and hard work, we can make a new generation of many peoples “hear and fell and see’ Conrad’s “Lord Jim”. The versatile Peter O’Toole took the leading part of Lord (“Tuan”) Jim. For the other parts, Brooks gathered a party of an international and great cast : “Jack Hawkins as the narrator and Captain Marlow ; James Mason as the river pirate Gentleman Brown ; Curt Jürgens as the infamous Cornelius ; Eli Wallach as the evil General ; Paul Lukas as the sagacious trader M. Stein; Akim Tamiroff as Schomberg the colorful owner of the rundown waterfront hotel Schomberg ; Daliah Lavi as the Girl and Christian Marquand as the French officer”. 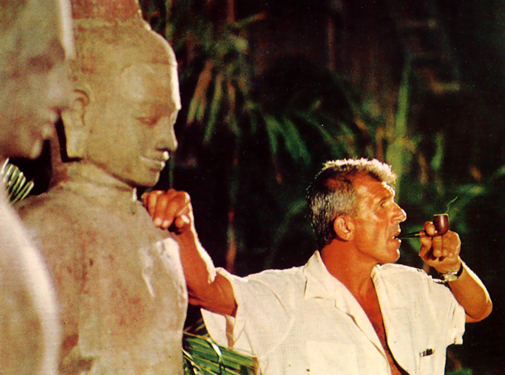 After “Lawrence of Arabia” (1962) and “Beckett” (1964), Peter O’ Toole gave an intensive and outstanding performance. 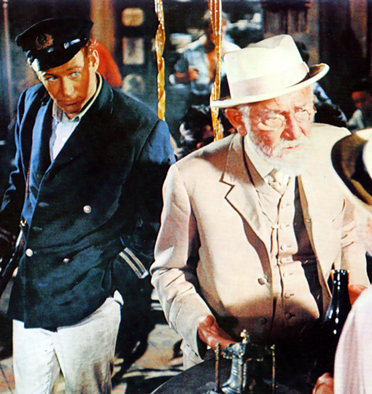 Even if the Irish actor kept a bitter memory of “Lord Jim”, he recognized later that it was one of his finest roles. 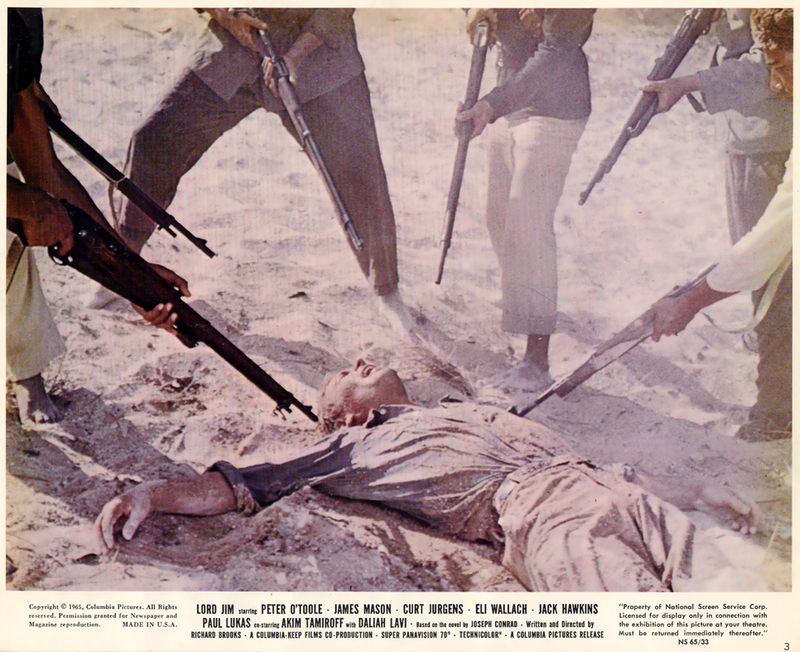 The performances of Hawkins, Mason, Jürgens, Wallach, Lukas and Tamiroff, were all marvelous, as usual. 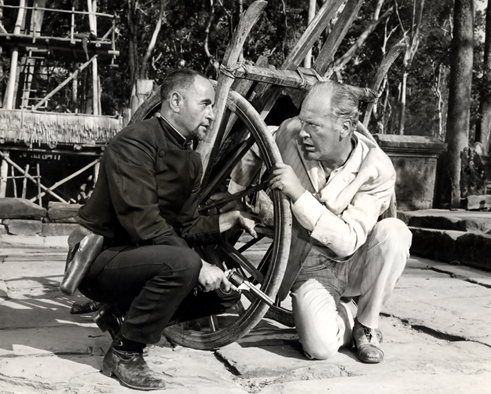 Christian Marquand played with a great sense of humanity the short part of the French officer who understood the despair of Jim. 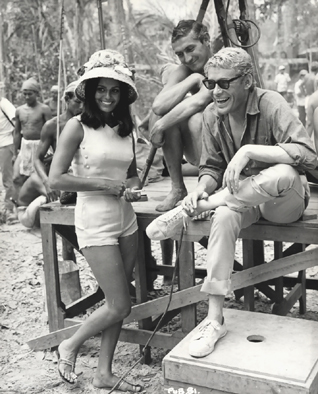 The gorgeous Israeli actress, Daliah Lavi played with a great sensibility the coolly Patusan Girl who fell in love with Jim. It is probably her best role on the screen. The acclaimed cinematographer Frederick A. Young (“Lawrence of Arabia” (1962); “Doctor Zhivago” (1965)) and the talented production designer Geoffrey Drake (“Guns of Navarone” (1961); “The Victors” (1963)) were chosen by the production. Bronislau Kaper, the Polish origin composer, gave one of his most brilliant score and probably for the whole screen. He managed to merge a large symphonic orchestra and native Indonesian orchestration with the valuable help of gamelan musicians. 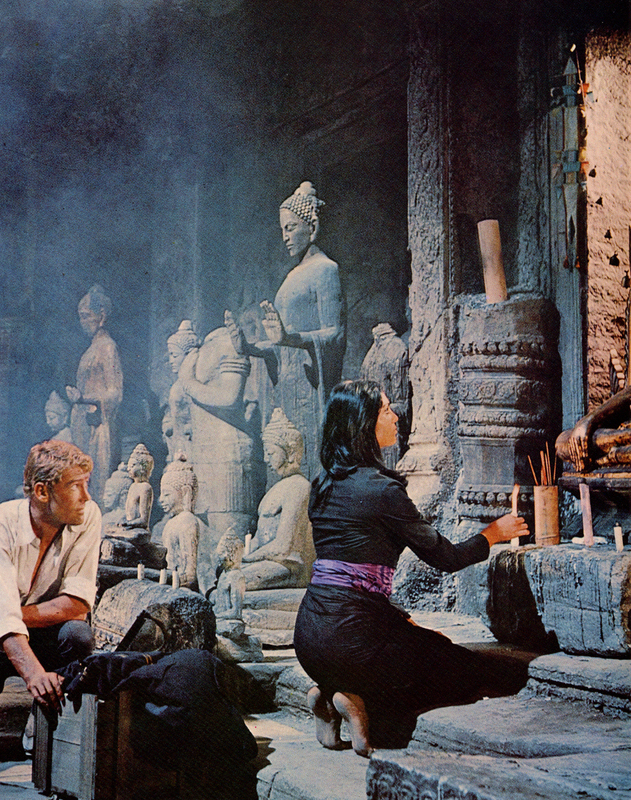 The film was photographed in Super Panavision 70 at Shepperton Studios, England, and on location in Angkor Wat, Cambodia, Lantau Island, Hong Kong and Malacca, Malaysia. Despite the hard conditions of the filming (bad food, heat, snakes and jungle creatures), Brooks’ Film received two BAFTA nominations (best British art direction and best British cinematography). Unfortunately, best efforts are not always rewarded and the reviews were not good in America. Only European critics and audiences (especially in France) gave good responses to the movie. 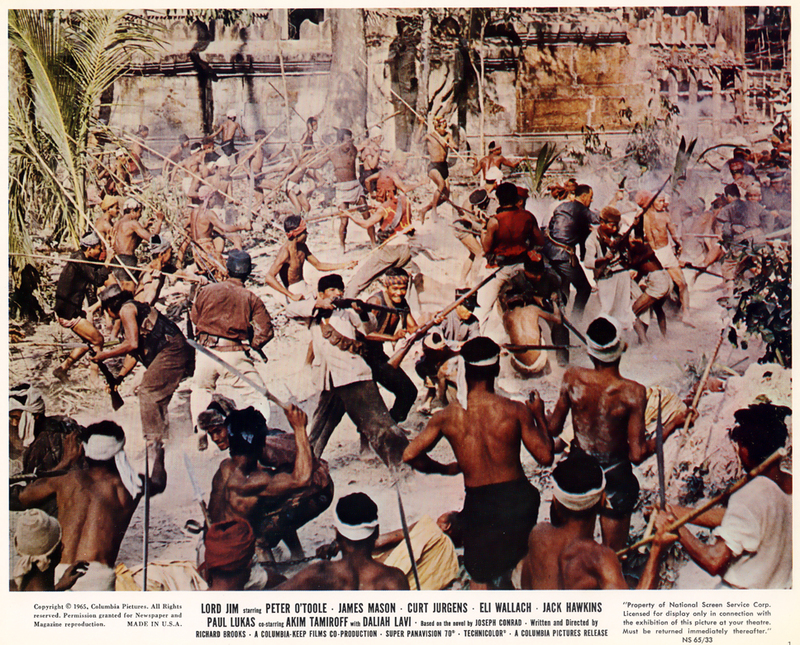 “Lord Jim” was the biggest challenge and most expensive film ($9 million) in Richard Brooks’ career. I regard it as his masterpiece. 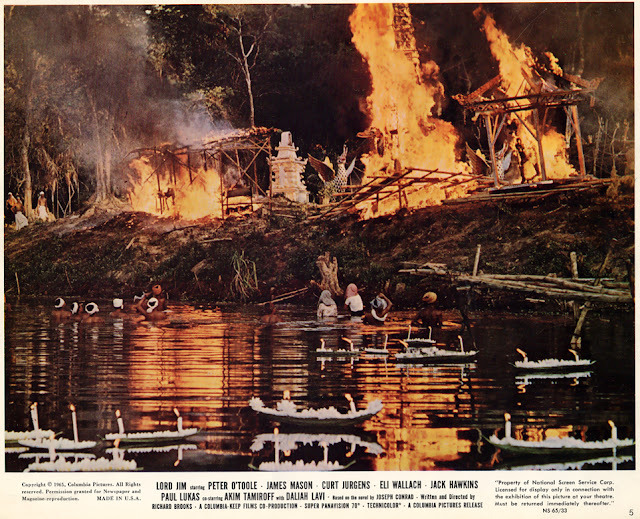 We can understand the reasons why, several years later, Brooks’ vision of “Lord Jim” inspired John Milius and Francis Ford Coppola’s in the making of “Apocalypse Now” (1979) based on Joseph Conrad’s novel “Heart of Darkness”. “One hope kept Jim going a hope common to most men. Rich or poor, strong or weak who among has not begged God for a second chance ? ...” . “Tough as Nails” (The Life and Time of Richard brooks) by Douglas K. Daniel (in English) ; 2011, The University of Wisconsin Press. “Richard Brooks” by Patrick Brion (in French) ; 1986 ; Ste Nlle des Edition du Chêne. CD Album of “Lord Jim” by Bronislau Kaper ; 2005 ; FSM Vol.8 N°11.